Once again I'm struck by the excellence of offerings from the Naxos label. I've been adding to my modest collection of works by Brahms. I'm familiar with his piano quintet but hadn't heard either string quintet before. The addition of a second viola creates a luscious sound that is quite wonderful. As I write my review I'm listening to this noteworthy performance. I'm not educated in the subtleties of orchestral music, so I can't comment on details of the performance. But I've been a singer much of my life and feel I have a very good ear. I love what I'm hearing in this compact disc. I doubt you would do better if you paid twice the very reasonable price of this recording. I encourage you to try this and other Naxos titles. You won't regret it. Here is an outstanding opportunity to explore Brahms' two string quintets beautifully played at a budget price. Brahms wrote his two string quintets at the height of his creative powers using, as did Mozart in his quintets, an additional viola to add to the string quartet. These works are both lyrical and accessible, full of waltz melodies and gypsy tunes. The performers on this CD are the Ludwig Quartet, a French ensemble which has served as the resident quartet at Yale University, together with violist Bruno Pasquier. The CD is ideal for the listener wanting to get to know Brahms's chamber music. Brahms composed the string quintet no. 1 in F major, op. 88 in 1882. By this time, he had composed his first two symphonies, the second piano concerto, and the violin concerto. The quintet is in three movements rather than the usual four and features melody. This quintet is one of Brahms's less often played chamber works. The first movement opens with a lyrical, strong, and rocking theme reminiscent of Schubert followed by a slower, even more songlike theme given first to the cello and then to the upper strings. The themes are developed with counterpoint, and upon the return the five instruments play in unison to lead to a triumphant conclusion. The second movement is actually a combination of a slow movement and a scherzo. It opens with a glowing slow theme in the middle strings which is interupted twice by rapid passages, in which Brahms borrowed from works written in his youth. The finale is in sonata form but is in counterpoint throughout. It opens with two large chords. Listen for the lively, giddy and piping theme that occurs throughout this movement in the high register of the violin accompanied by the low register of the cello. The string quintet no 2 in G major op. 111 dates from 1890. By this time, Brahms had composed all four of his symphonies and had some fear that he might be burned-out as a composer. In fact, he wrote this work as his farewell to composition, but, fortunately, he did not follow-through on his intention. The work is in four movements, with the outer movements being strong and cheerful and the two middle movements melancholy and reflective. The work opens with a powerful theme for the cello which has to battle against a loud, ringing accompaniment in the higher strings to make itself heard. Brahms initially intended the opening theme of this work for a symphony. The second theme is a Vienniese dance which moves gracefully from the lower to the upper strings. The opening movement is lengthy but tightly written. It is exquisitely performed here. The second movement is a theme with variations that builds in intensity. Note the long frilly cadence for the solo viola before the theme returns near the end of the movement. (The term for this type of solo passage is "roulade".) The third movement is quiet and melancholy, slightly quick, with a contrasting waltz-like section in the middle. The finale is a brief and lively rondo, and in it Brahms used gypsy themes. Note the very fast, jerky dancing theme with which Brahms brings the work to a joyous conclusion. This quintet has always been more frequently performed than the first quintet. Brahms himself expressed special affection for both his string quintets. In their lyricism and strength, they are excellent works for the new listener to Brahms's chamber music. 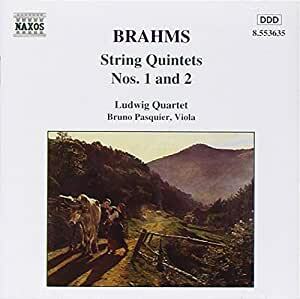 I encourage you to get to know Brahms's string quintets with this fine CD. I always found Brahms quartets a bit lacking (although I still do enjoy them), and I think part of the reason is that the medium didn't really allow him to compose in a style natural to him. The pieces lack the lyrical flair and inventiveness to which he owes his fame. 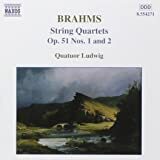 Conversely, these string quintets, with the added viola a la Mozart, allow Brahms to write in the style he is best known for - lyrical and thematically dense and full of polyphonics. It's a shame that there are not more recordings of these pieces to be purchased - a quick scan shows no more than 15 recordings of either piece, some on obscure labels. This disc, like much of the Naxos catalog, offers an inexpensive and very well performed and recorded alternative to the rest of the entries. I do enjoy this disc, and it is a very nice performance, but for me, my favorite version is the Hagen Quartet's Deutsche Grammophone (import) offering of the two pieces. It's more expensive, but it is worth the price in my opinion (if it is even still in print.) Another alternative would be the Leipzig Quartet on MD&G. However this recording is more than suitable for anyone who would like to expand their collection of Brahms' chamber works. It is some of his best chamber music, along with the Clarinet Quintet op. 115. I have a mixed view of this recording. The performances, like those in their CD of the first two Brahms quartets, tend to be slower than most. They ignore, or significantly reinterpret, directions such as CON BRIO. But they have something to say in their own poetic way and do it well. If the recording were better, I'd give it four stars. My favorite CD of these quintets is the Nonesuch recording by the Boston Symphony Chamber players. Although derived from analog tapes and several decades old, the recording is much clearer than this Naxos digital CD. A much newer CD of the first of these quintets with the Shanghai Quartet shows how much is obscured by the poor recording quality of the Naxos CD. I am puzzled that Naxos can produce excellent CDs with the Eder, Kodaly, and Maggini quartets and then allow this CD to pass quality control. Particularly in 111/I, they play sometimes out of tune -- the main theme at the very beginning, and in the development, where the cello, too, sounds rough. Op. 88 is better, but on average I wouldn't recommend it.